Here’s another in another in a series of famous/popular gins that I’m giving a better treatment to. I think that my initial review of Gordon’s might not have given the same thorough treatment that I’ve given other gins. Given its status as one of the most senior gins out there [having been produced since 1769!] I think it would only be right to give it a more thorough review. As before, the original review is still available if you want to see what we originally said. Ask some pedants “What’s your favorite Scottish gin” and they might reply “Gordon’s.” Although it originated in England, the UK version is currently distilled at Cameron Bridge in Scotland. The variation I have was not distilled in Scotland, it was distilled in Canada, and bottled in Norwalk, Connecticut. Gordon’s is truly international. So the idea that it’s of the place where it is distilled is somewhat nonsensical. It is British in origin, but it’s provenance has transcended the place where grain is turned into gin. It’s purported to have at least four botanicals in it. Juniper, coriander and angelica are oft repeated and likely to definitely be among the bill. Licorice, orris, orange and lemon peel are also mentioned, but somewhat less frequently. The exact bill is a secret. Nose is heavy with pine-laden juniper, with a peppery/resinous undertone. Coriander lurking on the edges as well, with a slight hint or citrus and a menthol character. Quintessentially classic. The palate is more of the same. Bright piny juniper, with hints of coriander, lemon zest. The finish is medium-long in length with an unmistakable juniper burst, but there’s some complexities and complications which emerge that challenge the notion that Gordon’s is a one-note gin. Earthy spice, a hint of angelica, a touch of baking spice and a glow that slightly calls to mind a middle ground between licorice and mint. Certainly on its own, you can pick up a lot of depth and character, though I find that some of these intriguing low-notes are lost mixing. Fear not though, it does mix well, but it might lead you to believer there isn’t a lot going on here. There’s more than first glance might tell. I’m sorry for my friends in the UK, but the variant of Gordon’s bottled at 37.5% ABV is rubbish. It tastes of watered down gin, and much of the nuance is lost. Frankly, that lower ABV variant was among my first tastes of Gordon and I was not impressed by it. I’ve grown to appreciate how vastly superior the 40% ABV variation we’re fortunate enough to have in North America is, while I think that the 47.3% ABV export variation is superior in terms of appreciating the botanical nuance, I find that while it mixes better [owing to its strength], it doesn’t read as clearly as Gordon’s Gin. In short, I prefer the 40% bottling and the 47.3% Export Strength if you can find it, and would go out of my way to avoid the watered down version at 37.5% ABV. They’re all the same gin underneath, but as we find in many of our reviews strength does matter in terms of botanical representation and mixing. The Negroni had a crispness to the nose, and the palate was balanced with pine and citrus in the background, and a clean, albeit bitter finish. there was a good balance at work here, with it reading to me in my notes as “quintessential Negroni.” It’s exactly what you expect, and Quite nice. We’re continuing to go traditional here as we mixed up a Gimlet. The nose seemed somewhat understated, but the palate was rife with lime, lemon, coriander and resinous pine notes adorning a medium length finish that ends with a flourish of sweet lime. 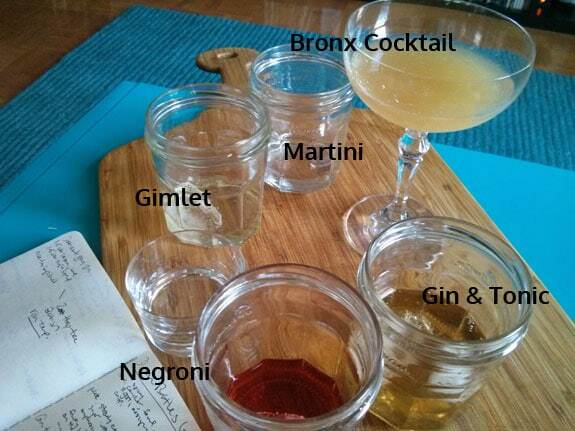 Next we tried a Bronx Cocktail. It was like an orange flavored martini (which c’mon, is essentially what this is, albeit a perfect one). Orange, oxidized wine notes, juniper and coriander in the middle and wormwood/nutmeg hints on the finish. Brimming with complexity, the cocktails seems to occupy a weird space between, “perhaps a bit too fruit forward for aficionados of bitter cocktails” and a “bit too bitter for aficionados of sweeter cocktails.” Though this isn’t on Gordon’s here. It does fine work, but doesn’t transform the cocktail. Finally, it seemed fitting to mix up a Martini with Dolin Vermouth. A hint of citrus zest at first along with sunny juniper. Lemon and orange rind notes as well. Nutmeg with some intimations of anise and licorice as well. Slightly bitter towards the finish with a clean, dry texture. Wormwood and juniper whet the palate for the next sip. I’d say the 40% is not so great but the 47.3% is a 4 maybe even 4.5 star gin. I was disappointed because I know that Gordon’s Gin is better than this. I don’t know, I’m going to need to get some of the stronger stuff and see how it holds up. Is it just my palette after so many gins isn’t feeling Gordon’s the way I used to? or was the 40% just much weaker than I had remembered it being? I think it’s just impossible for a standard gin to stand up to the traditional recipes at 40%. 40 to 47 is quite a substantial jump right off the bat. The question, though, is where to find the higher proof Gordon’s in the States? I’d be all over that. All I know is this was the first gin I had and it roped me in. Did its job, then. I suppose you already know this, but the Gordon’s sold in the U.S. is made in the U.S. and is not the same as the Gordon’s found in (most of) the rest of the world. When I’m in the Caribbean, I can find a 1.75 liter bottle of U.S. Gordon’s right next to a liter bottle of British-made Gordon’s. The British Gordon’s is much better all around than the cheap American version, and the American version is more expensive per liter! In Spain, they sell a bottle you can´t open without a sharp knife and a lot of patience. You probably spill a quarter until you get it open. The most stupid I’ve seen the last 60 years. As a gin and tonic expert (self appointed) with fresh lime, you can’t beat Gordons with Schweppes mixer. Have tried others but all fall short. Gordons for me every time. I think Gordon’s is a good gin, but prefer Beefeater for martinis. Gordon’s at higher proof would be really outstanding if you can find it in the US. Current Gordon’s is produced in Canada for delivery to the US. Just doing a gin and tonic tasting session tonight. With duty free Gordons 47%, Duty free Tanquery 47.3%, and Sipsmith 41.6%. I have been just using a twist of lemon peel, twisted above the glass tgen dropped, virtually bo pith on the peel. Schweppes tonic water. Sipsmith absolutely stunning, classic juniper and citrus. Creamy smooth mouthfeel. Lingering spices, a ripper! Gordons: very good, clean crisp very well made, citrusy, juicy spirit, beautiful nose, clean mouthfeel…perfect for summer. Tanquery: Nice nose. Bitter mouth puckering palate, not good. Juniper and a lot of licoroce. Big bitter licorice aftertaste. Quite yuk. Maybe a bad batch. I am usually a Tanquery fan. Wife thought the similar for all tastings by the way, especially that Tanquery!! I have got one more unopened bottle of tanquery…will be interesting. Ps my Mum has also gone off Tanquery..hmmm. “just don’t get me the green one” she says! Sorry for grammar errors above. A gin review after tastings posted from a phone….! 47% export strength Gordon’s isn’t bad. You are fortunate to be able to buy 40% strength in the USA because they have reduced the strength to 37.5% in the UK and in many other European countries (to reduce the duty). Furthermore, Schweppes tonic water in the UK contains saccharine – so it tastes really vile. Absolutely unbeatable taste at $8/750mL and $16/1.5L in my area. I prefer Brokers or Beefeaters for my martinis, but this is definitely passable in a dry martini and excellent with Shweppes tonic. Gordon’s Gin & Tonic in the can has gone off.The last 3 6 packs I have bought have been undrinkable.It tastes like a dirty sock in each can.I took a batch back to the retailer in Sydney Australia today & he gave me a refund.He then put them back into stock.I won’t be buying any more for a few months until a new batch comes out. I also have many gut problems & find G & T is a great help to settle the gut & it’s yum. Just returned from Wimbledon where the Gin&Tonics were flowing! Someone had posted that Schweppes tonic water has saccharine in it and tasted horrible: this is partially correct. Schweppes tonic water from India has two versions…regular and “Slinline” (written in small red letters) which is their version of diet Schweppes tonic water here in America. For me, Schweppes regular is by far the best tonic water and I do agree, diet Schweppes or Slimline in Europe, must be avoided! PS- Also, avoid Fever Tree tonic water…it’s way too bitter! If you feel the need to reduce the sweetness of Schweppes, squeeze some lime into your drink, old boy!